Hamilton was fastest in both practice sessions at Hockenheim today but the Ferraris are on the pace and Massa spent most of the time at the top of the sheets. With Kovalainen also mixing it, second in the first session, fourth in the second, the struggle between McLaren and Ferrari looks as close as it has ever been. At this stage, the winner on Sunday should be one of their drivers. Rain could be an additional factor, however, the first practice being run on a damp track and there is a strong possibility of showers for the GP. Hamilton seems a good bet even so and it is further down the order that there might be some surprises. In that case, who are the most likely candidates? Alonso and Rosberg looked strong in both sessions, with Nakajima backing up his team leader well in the wet; Vettel too was excellent in the first session, Webber in the second. The BMWs were a bit slower than might have been expected but they usually are on the first day. The good news for the team is that Heidfeld has definitely overcome his problems and was right with Kubica in the second practice. All of those mentioned have to be potential point scorers, especially if it rains. This narrowing of the gap between teams makes predicting results very difficult but also means we are enjoying the most competitive season in a long time. 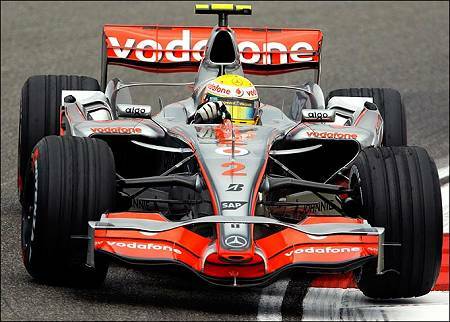 The one constant is Hamilton - rain or shine, he must be favorite for victory but, after that, the race is wide open. One could easily take the conservative option and suggest Raikkonen, Massa and Kovalainen for the the next three places but that does not happen often, Lady Luck intervening to confound our expectations. BMW cannot be ruled out as they are always better in the race than practice and Alonso is bound to be spoiling our reasoned guesses. Those whose challenge will fade are more easily identified. Webber, Vettel and Rosberg are looking good now but invariably encounter problems in the race. Nakajima is a fair bet for a points finish but no more than that and Coulthard might sneak a few too. Other than that, we are down to the battle not to be last. Both Honda and Toyota have fallen into this category again, having discovered the secret of the yoyo from one race to the next. Trulli is always capable of putting in a fabulous qualifying lap, of course, but will be battling below the points in the race. And the Force Indias have a mountain to climb still, along with Bourdais. Which leaves only Piquet and what to say about him? I find him totally unpredictable, close to his team mate one moment, a second adrift the next. Thus far this weekend he has been well behind Alonso but has time yet to come good. On balance, I will hedge my bets and put him down as an outsider for a point or two. Time to stick my neck out. I guess Hamilton for the win if it stays dry, followed by Raikkonen and Kubica. If it rains, I'll have a wild fling at victory for Heidfeld, then Kovalainen and Kubica (Hamilton will throw it off the road). Okay, it's optimistic but who would have guessed Heidfeld and Barrichello for the podium in Britain? Rain or shine, you gotta believe it's Hamilton. After that it's a toss-up between the Ferrari's. Then comes Kubica, Weber and Alonzo. Just my take on the race. Hamilton is the man right now. He is almost unbeatable. Notice I said almost. I would predict a first or second place finish for this race. Certainly looks that way, Forrest. Amazing what a difference a win makes - a couple of weeks ago people were talking of Hamilton as a has-been. And Don, I must admit I too have the feeling it will be a while before Kovalainen wins one. But I can see him getting a podium or two quite soon.